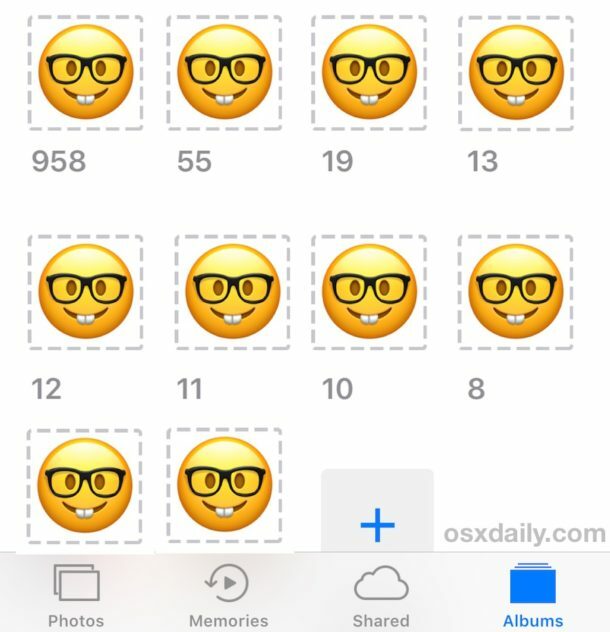 One of the many new features in iOS 10 is facial recognition software, which automatically scans every photo on your iPhone, iPad, or iPod touch, determines what is a person, who has a unique face, and then automatically sorts those pictures into a “People” photos album for each unique face. The face recognition aspect of iOS Photos is pretty accurate, but sometimes it can erroneously identify the same person as multiple different people. This is particularly true if you style your hair differently, alternate between wearing a hat or not, gain or lose weight, have facial hair and then shave, and any other scenario where someone’s face appearance changes. Fortunately, it’s very easy to merge different faces in the People photo album of iOS, which is the simplest way to correct any inaccurate People album face sorting. This process also seems to make the Photos People face recognition album more accurate, as it appears to learn from face merging what the same person may look like under different scenarios. 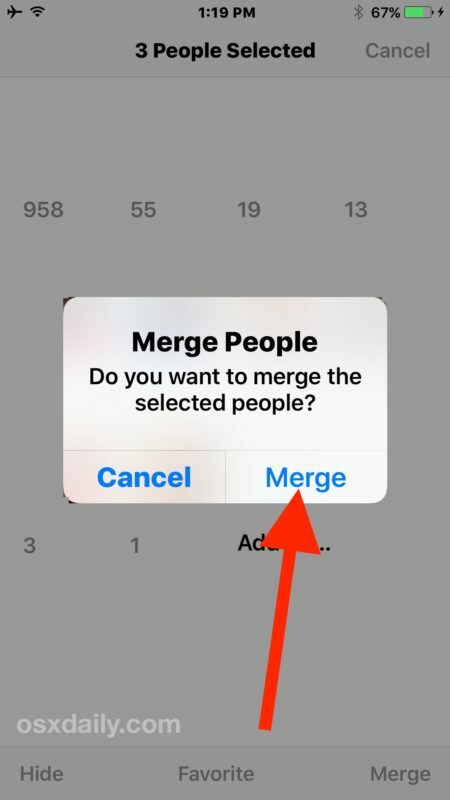 Let’s walk through how to merge faces in the Peoples album of iOS 10, and we’ll also discuss the Peoples face feature a bit more and how it can not currently be turned off. The Peoples albums will re-sort with the merged faces and the facial recognition appears to get smarter from each merge. Can I turn off facial recognition in iOS 10 Photos? Some users may decide they’d rather disable facial recognition and the Peoples album in iOS 10, perhaps because they don’t want to deal with the initial slow speed after updating to iOS 10 (though yes any sluggish behavior entirely resolves itself after the albums have finished sorting), or due to privacy reasons. 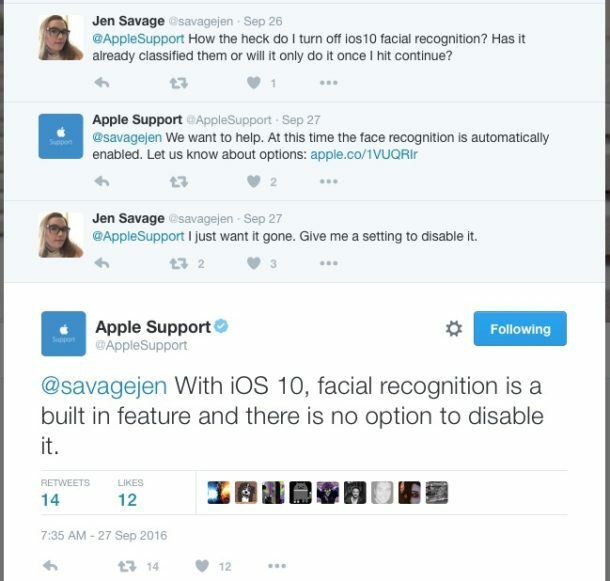 But, sorry, that is not possible at the moment, and according to official Apple Support there is no way to disable facial recognition in iOS 10. Currently there is no way to turn off the facial recognition aspect of iOS 10 Photos app directly. It appears the only way to avoid facial recognition scanning your photos in iOS 10 is to not have any photos on the device, which is a fairly unlikely scenario for most iPhone and iPad users. To me, this sounds like an oversight for a company that prides itself in privacy and choice. Hopefully this changes in a future software update and we get a simple Settings toggle to turn facial recognition and People album off or on, since many users and privacy advocates would prefer to not have facial recognition sorting through pictures on their devices at all, or at least would like some control over it. For what it’s worth, the iOS Photos “faceprinting” and facial recognition scanning is, according to Apple, accomplished entirely with local data and not by using the cloud or any remote service, meaning neither Apple nor anyone aside from the device itself can access that information. That should relay most privacy concerns about the feature, but nonetheless, not everyone is thrilled with the idea. 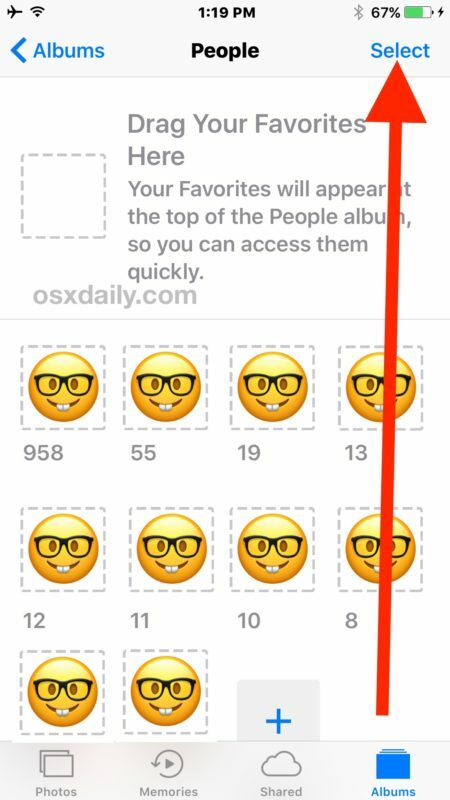 Since there is no way to disable facial recognition in iOS 10 for now, you might want to just focus on making it more accurate (or less accurate if you want to throw it off for some reason). Surely future versions of iOS will add additional features to adjust how the face recognition abilities work though. I want to turn off facial recognition, I do not like that idea at all. Maybe iOS 10.1 will give us this option. You can’t. Why don’t you like the idea? Do you actually have a reason? Just don’t assign any names then. The reason is called “PRIVACY.” That is an actual valid reason in itself. I think it’s pretty neat to be honest – I’ve a few people it missed the first time through – do I have to add faces manually or can I get it to run again after I’ve manually added a few of the faces? 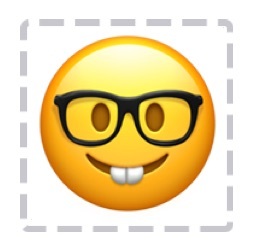 To think that Apple has now made face identification mandatory on every one of my photos, and that there is no option to disallow this, is maddening and disrespectful of my privacy option concerns. I am being burdened with the strongly unwanted mandatory feature of having everyone facially fingerprinted within my multiple photo albums. Even if, in some uncertain future, I am provided with an option to turn this feature off, the damage will be done the next time I access my photos after this update. I have gone so far as to stop using Facebook because of the lack of concern about my privacy. Do I need to do the same with Apple iOS now? I understand the concerns and I hope Apple gives us a setting to toggle off facial recognition and album identification. The same technology also identifies landscapes, dogs, cats, animals, buildings, cars, etc. It’s neat, but it should be opt-in, because I don’t want metadata gathered about my pictures… in Photos app or iCloud or anywhere else. Cool. Voluntarily give your fingerprints to a faceless mega-corporation. Now give your it all your photos and all your friends/family photos and tag/identify everyone for them. Maybe next year we can salivate/urinate on our apple devices and it will instantaneously quantify your genetic profile so suckerberg can send you targeted ads for your pancreatitis because you thought you only had heart burn. If you have nothing to hide, you have nothing to fear! Quit being a whiner, you’re starting to sound like me! Europeans have a much more enlightened policy when it comes to realizing that consumers own their own data, and can control what will be done with their personal data. Americans have sold out to the idea that there is no privacy for consumers, and that their private data can be repackaged and sold by corporations for profit. I have very strong ethical objections to this. I strongly believe that my personal data is owned by me and not by corporations. Unfortunately, the American Court system, following the laws written by the powerful private corporations that are seeking to maximize their profitability, disagrees. If there are people who wish to expose their life details on platforms like FaceBook, they are free to do so. I choose not to do so, because of the repeated disrepect shown by FaceBook for users’ privacy and their continued disrespect for the users themselves. In addition to this latest breach of choice and trust by my beloved Apple Corporation, it is just about impossible to keep one’s name clear of the vast data collection going on by private companies for their sole profit. It is a constant battle to keep one’s personal information off of the following websites that are collecting your data and selling your personal information (some information is not even accurate) for their sole profit: Spokeo, Intelius, Accutellus, Lexus Nexus, ZoomInfo, MyLife.com, Checkmate Inc. Depending on their particular policies, they will remove information but then add it back at a later date, or not even allow you to remove and revise the information that they are selling about you. Similarly, if someone in the United States uses their constitutional right to plead the Fifth Amendment, this in no way is a demonstration that they are guilty. They are actually exercising one of their rights under the United States Constitution. Please contrast this with our major corporations that, time and time again, pay major fines and settlements when they actually break the law, yet are allowed to freely sign off on legal statements that they do not admit that they have done anything wrong. All of you should really take some time and educate yourselves before commenting. Apple has stated, time-and-time-again, that all the facial recognition is being done ON THE PHONE. It’s not in the cloud, and none of that information leaves the phone. This is true in Photos on your Mac too. In fact, that’s maddeningly stupid, because now I have to retag faces that are already tagged on my Mac all over again. So explain how the phone assigning names to faces is invading your privacy? Is your Contacts app also empty on the phone? Regrind your fingerprints, Why Question must be an Android troll. Apple has the Secure Enclave in the iPhone. Your encrypted fingerprints don’t leave the phone. The fingerprint data is stored in an encrypted form which can only be decrypted by a key available by the Secure Enclave thus making fingerprint data walled off from the rest of A10 Chip and as well as the rest of iOS. The current spate of unethical, illegal, and outright lying by companies should give you pause before accepting corporate statements without question. The latest egregious example is Wells Fargo targeting to fire EMPLOYEES WHO CALLED THEIR ANONYMOUS ETHICS HOTLINE TO REPORT THE ILLEGALITIES THAT THEY WERE WITNESSING. I have never allowed facial recognition for any of my thousands of photos. To have my choice involuntarily taken away from me by Apple is maddeningly disrespectful of my privacy option concerns. I assure you that I have taken your previous advice and spent a lot of time reading, researching, thinking about, and educating myself before commenting. Privacy is an important concern that I follow closely, including legal cases, such as the United States Supreme Court Case, “Spokeo, Inc. vs. Robins” (No. 13–1339). From reading my posts, it should be obvious that I am not a crazy paranoid conspiracy theorist “babbling” (your word) about privacy. I no longer use Facebook because of their lack of concern about my privacy. With this latest misstep by Apple, I must reconsider my love affair with their products. I’m with you. I will not be updating. That “yet” is exactly the way I feel. Apple is starting to feel like a predator. Have never signed up for Facebook. Kudos to you for never having signed up for FaceBook. This country and world needs more people like you. You think that’s bad? How about the new “feature” where Apple invades my private voice mail messages, transcribes them, and sends me a transcription! I’m a lawyer and this is a gross and likely criminal invasion of my client’s private communications with me. Bad enough? How about when someone subpoenas my phone, apple, a client’s phone, etc. to get a copy of that transcript, which is probably being kept somewhere. A subpoena can go out, get responded to, and get results before I even know about it. To top it off, what if the transcription is wrong (which it often seems to be). “I didn’t run that red light” can become “I did run that red light”. Even my girlfriend got visibly angry when I showed here this new “feature”. If you are a lawyer, and I can be involved with you to help in any way, I feel strongly enough to fight against this invasion of privacy. Take me up on this if you wish. On the IPhone 5 If you “Click” on Albums then you should see People. 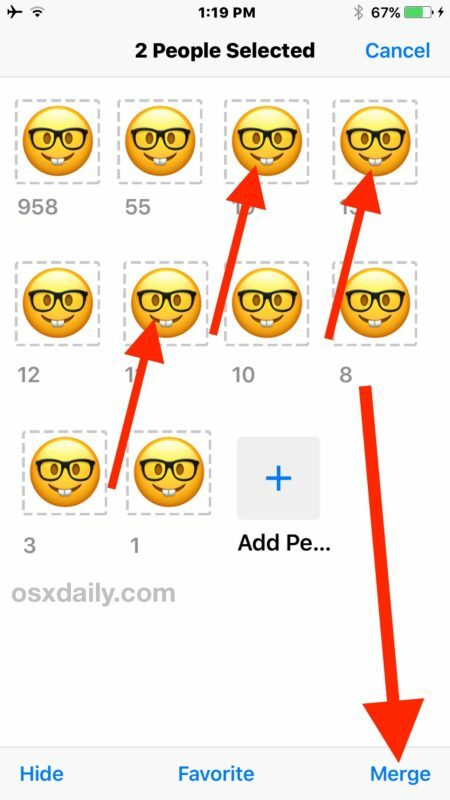 I believe that you are the author of “How to Merge Faces in iOS Photos & Improve Facial Recognition,” as well as many of the fine “OS X Daily” tips that I look forward to seeing in my email box each day. Do you have any comments on the long string of comments that this article has spawned? Thanks Yank, I’m glad you enjoy reading OSXDaily! Thank you for all of your fine insight and useful tips. I still don’t know how you can come up with this, day after day. I haven’t installed iOS 10 to yet, but has anybody figured out anything about how the information is stored? Is Apple using the EXIF data and embedding this in the photos? I guess there’s some sort of standard for this because I’ve seen Lightroom do this, which includes a name and a region. If this is how it’s done, then uploading the photo “leaks” the information from the phone. I personally don’t get why people are so keen to help Google and Facebook compile a database of everybody. Their facial recognition software is so fast now that they can take a live video feed and identify people live. For the paranoid this means “Minority Report” is almost here. Very annoying. I personally don’t get why people are so keen to help Google and Facebook compile a database of everybody. Their facial recognition software is so fast now that they can take a live video feed and identify people live. For the paranoid this means “Minority Report” is almost here. Very annoying. We don’t even get anything back either because the users of Facebook for instance aren’t the customer, and I think I already see too much advertising without giving them free help to bombarding me with more c***! How to delete unwanted faces? The only option here is to hide it. There is this random person passing behind me when the picture was shot and now I have him with his face. First select the faces you don’t want to show on people and click on share button and then Not this person. It’s really nice of Apple to say that the face recognition data is kept on the device. But to think that this means it will always be that way is naive. You can even avoid using Facebook, but that doesn’t mean that photos of you will never make it there and become identified. Think about five years from now when the recognition algorithms are accurate enough to essentially be always correct, how will you keep your face private when a stranger takes your photo? I don’t care for the loss of privacy this technology has enabled, but it’s a bell that cannot be unrung now.